OMG – this seems so simple and smart and nostalgic. Kind of like a homespun idea from a century ago. Back to a time when it was not possible to buy whatever you thought you needed with a few clicks. No, you had to make do, or recreate or fix something that had broken. Or just be far more mindful and careful with the stuff you already had. Possibly also, buy things which could be used in many ways, rather than a single use device. There was a TV show some time ago called, ‘ready, steady, cook’, or something like that. Participants had to make do with a reasonable pantry and 3 surprise ingredients. Of course it was timed and it was a competition, but at home I like to work like this. There is never a shortage of food in the fridge or the larder. What there is a lack of is creativity and the willingness to try and make do with what you have. Go a day without buying something and continuing to add more to the house than you get rid of. Ever more tipping the balance towards excess, instead of less. Not surprisingly, this is the area most of us need to get far more comfortable with. If we even just waited a day or two and thought about what we needed versus what we already had. It might be surprising to see how novel solutions presented themselves. If we just put our brains to work on these kind of problems instead of being bothered with comparing and judging our self worth against the material possessions of others. While we are contemplating how to use what we have, why not take the opportunity to build connection with others? In that process, possibly ideas can be generated to solve the problem at hand. Or the person on the other end of the line might have exactly the device you need and all you had to do was ask to borrow it. This was how the world used to work. We would never have stocked each of our kitchens with every device and specific appliance known to mankind, 50 years ago. We would have got together, at a party where the one person had an ice cream maker and we all would have taken turns churning it. Or we would have canned together, each bringing our extra harvest to share in the process. Or even Christmas baking, that was never done alone. The biggest borrowing institution I know of is the library. Where else can you visit and borrow the world? Literally anything you want to know more about and endless entertainment, all available with your municipal library card. I love the library and have enjoyed days spent lingering over the titles, reading a bit here and there and then carting my treasures home. Besides my own enjoyment, I loved teaching my kids about the magic of the library. It didn’t hurt that there was a child’s size, red fire truck in our library that the kids got to sit in and read books. Community gatherings were the place, where swapping used to occur. Somebody had extra tomatoes, traded for eggplants and peppers with neighbours down the street. This was how it was done. Never would we try and go it alone with every activity we were interested in. We would hand down our kids clothes to a family member or friend who had kids the next stage down, just as we received from those who came before. Which leads nicely into thrift as an action towards others, like giving or being thrifty ourselves. This is about being careful with resources like money. Not consuming excessively or impulsively. Instead, considering all the impacts of purchases, no matter the scale or cost. Even the act of creating a menu and then turning that into a grocery shopping list is a practice in being more thrifty. Studies show your chances of over consuming are greatly reduced by knowing what you want to buy before setting foot in the store. I love making and creating. So much so, that this can be a problem area for me. I make stuff I don’t end up wanting. I give the end result away. This means I need to be careful, because I can overbuy the materials I need for making. Like knitting. I had so much yarn at one point, not long ago. More than I could ever knit in my lifetime. I got the stash down to only the skeins which I loved. I gave away bags and bags of other crafting supplies in order to stay in the zone of working on projects I truly loved. In the end, all this downsizing created more space for creativity than if I had been overcrowded with arguably too many supplies. 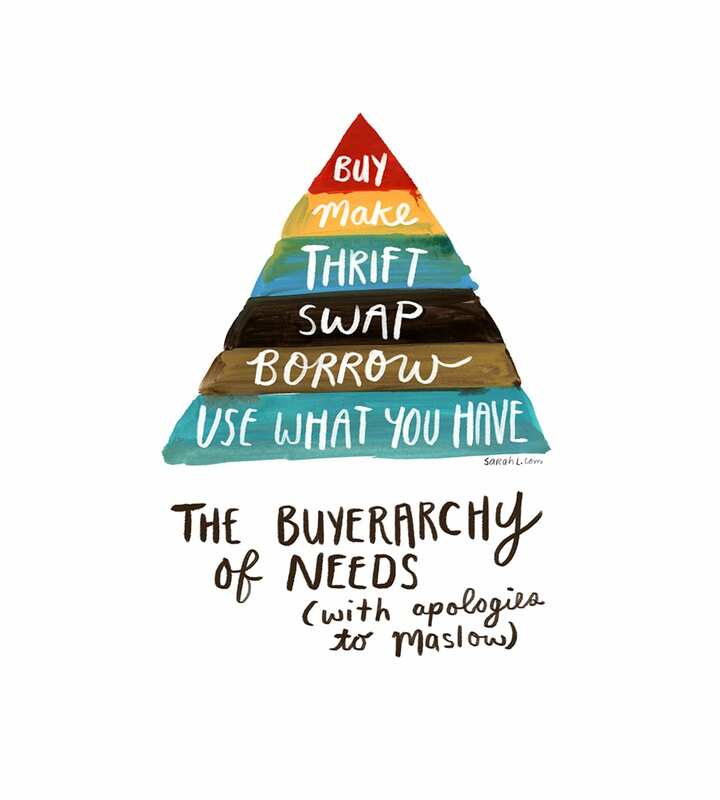 The thing we need to do the least of is buy stuff. While overconsumption seems to be a fact of life, our modern society could be more balanced. Instead, everywhere we go, every street we walk down, there is a way to spend money. All the free, public spaces seem to be disappearing. The idea of spending a day, doing things without spending money, now seems old fashioned and rather quaint. It is a shame that shopping is considered an activity, sometimes the sole interest of people, rather than an occasional pursuit. What would it look like if we allocated our time and effort towards a pyramid scheme like this? Reprioritizing our lives towards a balance like this, where personal ingenuity, creativity and self-sufficiency are brought to the fore front. The passive act of consuming would be likened to sitting on the sofa watching TV. Wouldn’t that be an interesting world? Maybe it is too much like turning the clock back and will never really take hold, but one can dream.